Online light dosimetry with real-time feedback was applied for temoporfin-mediated interstitial photodynamic therapy (PDT) of dog prostate. 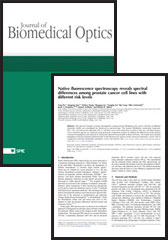 The aim was to investigate the performance of online dosimetry by studying the correlation between light dose plans and the tissue response, i.e., extent of induced tissue necrosis and damage to surrounding organs at risk. Light-dose planning software provided dose plans, including light source positions and light doses, based on ultrasound images. A laser instrument provided therapeutic light and dosimetric measurements. The procedure was designed to closely emulate the procedure for whole-prostate PDT in humans with prostate cancer. Nine healthy dogs were subjected to the procedure according to a light-dose escalation plan. About 0.15 mg/kg temoporfin was administered 72 h before the procedure. The results of the procedure were assessed by magnetic resonance imaging, and gross pathology and histopathology of excised tissue. Light dose planning and online dosimetry clearly resulted in more focused effect and less damage to surrounding tissue than interstitial PDT without dosimetry. A light energy dose–response relationship was established where the threshold dose to induce prostate gland necrosis was estimated from 20 to 30 J/cm2.